Beijing, (chinadaily.com.cn) 2014-09-17 – Twenty-four percent has cited the credibility deficit of the government as a main reason behind the lack of trust in Chinese society, according to a survey conducted by People’s Tribune, a magazine of People’s Daily. The survey finds more than 80 percent of respondents think of Chinese society as “sub-healthy” and 40.4 percent believe that a crisis of credibility is sickening society. The “symptoms” are, in order, distrust in “whatever the government says”, “distrust between people’, “doubt over food and medicine safety” and distrust in “doctors’ professional ethics”. 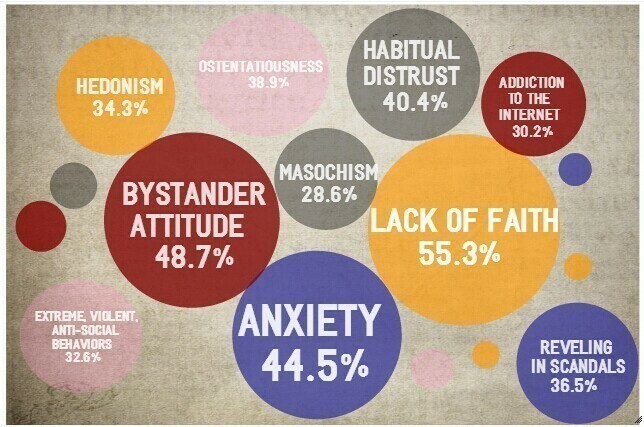 A lack of faith is the most recognized problem in the survey. When asked to choose which group suffers the most from the symptom, more than half of the respondents chose government officials. In a report of the People’s tribute, the choice was referred to a recent case of the self-styled “qigong master” Wang Lin, who claimed to have supernatural powers. He has been put under the spotlight after his photos with many government officials and celebrities were published online last summer. The superstition in officialdom mirrors corruption in the government, the report said. In terms of the reason behind the loss of faith, some 50 percent of netizens cited “unethical behaviors have gone unpunished”, while 20.8 percent blame the “mercenary” market economy. Extreme, violent and anti-social behaviors have been chosen by nearly one third of the netizens as another major illness of society, with the “disadvantaged groups” as the most obvious example. “The growing social inequality and feeling of deprivation” have been cited as the main causes.